Singing Lessons for Little Singers: "Singing Lessons for Little Singers" Author Publishing New Book! "Singing Lessons for Little Singers" Author Publishing New Book! Singing Lessons for Little Singers author Gregory Blankenbehler has begun a new, ambitious endeavor with the Pitch Perfect Publishing Company. As part of the Bel Canto Masters Study Series project, Blankenbehler will be editing and introducing important singing treatises of the 18th and 19th century for republication. "We thought that this was an important contribution that we could make to the world of vocal pedagogy, since most of these writings of the bel canto masters are either out-of-print or prohibitively expensive to purchase," says Gregory Blankenbehler. "These texts are quite important, however, because they relay the techniques of many of the greatest singers that ever lived. I have based many of my own teachings on their writings and am excited to make them more available to voice teachers everywhere." 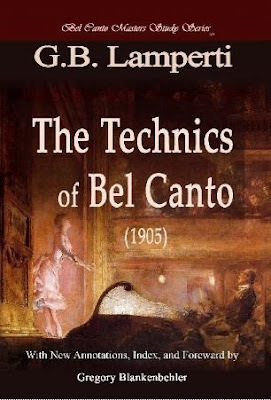 To kick off the new project, the Bel Canto Masters project has released their first installment to the public on Lulu.com: G. B. Lamperti's The Technics of Bel Canto ["Die Technik des Bel Canto"]. As the last of the great master-teachers of the “old Italian school” of singing, Giovanni Battista Lamperti taught his students virtuosic vocal techniques handed down from the great castrati of the 17th century: exquisitely rich chiaro-scuro tone, seamless flowing legato phrasing, undetectable passaggi register transitions and the delicately poised appoggio breath technique that allowed the astonishingly rapid coloratura typical of baroque music. In the only treatise he ever wrote, Lamperti the younger shares with all students, teachers and enthusiasts of singing, the techniques and skills that made his students that greatest singers of their time: the arcane secrets of bel canto.